Charlie Craven is one of the best tutors of fly tying I have come across. I first came across his marvellous work in John Barr’s book ‘Barr Flies’ – Charlie did the tutorials in that book backed up by superb step by step photos. I think they set a new standard in fly tying tutoring. 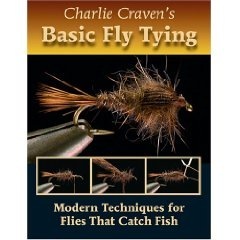 Now Charlie has his own book out , ‘Charlie Craven’s Basic Fly Tying’. Anyone working through this book will have covered most of the ground needed to tie almost any fly. If anything Charlie’s photos and words have exceeded the standard he set in the Barr book. I have been fly-tying for over 40 years, and I still learned heaps. If you are starting out fly-tying get this book, do not delay – so you do not learn the bad habits we old tyers have picked up. If you have a friend or family member just starting tying, buy it as a present, they will continue to thank you for it for years to come, every time they sit at the fly-tying desk. I have just updated the hook-removal article to include information on how to use both the ‘loop’ and ‘forceps’ method one-handed to remove hooks from yourself. This is usually required when the hook is buried in a hand or arm. When using the loop method, make the loop long enough to go over some immovable object, such as a tree branch. Hold down the eye of the hook and pull your hand away in the direction shown in the diagrams in the article. If using long-nose pliers or forceps, hold the hook eye down with the thumb of the hand holding down the forceps. Most thinking fishermen will be aware of the need to release at least some fish – those that are undersized, or surplus to immediate requirements spring to mind, and for some anglers, releasing fish as a matter of course. But there are ‘rules’ for releasing fish that will ensure the fish has the greatest chance of surviving. The faster you can get a fish to the boat or shore the better its chances of survival. The longer the fight the less chance the fish has of surviving. It is likely that the survival rates decrease exponentially as fight time increases. That is as fight-time goes up, survival chances decrease at an ever increasing rate. If you fish on a catch-and-release basis you should use gear that will minimise the fight time. The Number 1 Question Asked on This Site! Fishing Smells – how do you get rid of them? The smell of fish and fishing really gets some people going – and at the risk of being sexist it is usually at its most strident when female partners are involved in the discussions. Getting the smell off hands, etc is best done with any lemon scented soap or a mild dose of lemon detergent. Clothes are best attacked with good old NappiSan or any oxygen bleach, give them a soak first. But the very best thing of all for removing fishy smells from body, boat, clothes and children is “Simple Green”. It can take a bit of finding, but it does a great job. Trout fishermen are well advised to take a small flask of Simple Green in their fly fishing vest – it gets rid of the smell and residue of insect repellant and sunscreen – both of which you don’t want on your flies or leaders.